I have this down to a fine art - what to wear and what to carry. I know - it's obsessive! I THINK about this stuff - a LOT. It's my fave time of year and I'll be damned if I'm going to mess up even a SECOND of it by not being prepared. So here we go. With four to five movies a day, some days in completely different venues all over the city, there isn't much time for anything else but watch the movie, listen to the Q & A and then zoom out to get to the next one. My days would start at about 7:30am when I'd grab breakfast, preferably a substantial one as I wouldn't be eating again til early that evening. No time. Movie, movie, movie, movie, eat, movie. Then back in the hotel ready to sleep by about midnight. So you REALLY need to be self sufficient and ready for anything. But you are on foot, taking the subway or cabs so you can't carry around too much. Standing in line to wait to get into the theater, you don't want to be dragging around a large bag. And if you are carrying a coffee, you need a hand free. E-reader for line-ups when there was no one to chat too. This was not THAT likely as I've had some of THE best conversations with other TIFF goers. tickets of course. One year at TIFF I was 7 months pregnant with the girl. Pregnancy brain ensued as I threw out ALL my tickets along with a napkin. Smooches to TIFF staff who reprinted them all without any question. journal and pen. I'm in the midst of the Pathfinders course by Chookoloonks - need paper and pen for morning pages AND notes/quotes from movies I am seeing. And whatever pops into my head. toothbrush and paste. Obviously - I am out for 17 hours straight. And an umbrella - a small one to save space. One year I DIDN'T have one and while I was watching a film, it began to pour. No time to get one. No cabs to be found. Me running down the street being splashed with gutter water by buses and cars. Drenched. Squishy shoe drenched. Wonder why no one wanted to sit by me once I dried off during my next movie? More than a little whiffy and no time to change. You wil die, I tell you, DIE if you are without comfortable shoes. I might have been sitting for 5 movies (10 hours at least) but when I wasn't sitting, I was standing - in lines, for the subway, for coffee. They are looking a little worse for wear but they served me well. Clothes - fall in Toronto can still be hot and humid. Natural fabrics that can breathe and styles that are comfortable. JCrew cotton tunic with a leather belt over leggings. Muji cotton jersy tunics - cap sleaves and sleeveless - over leggings or jeans. Muji cotton raglan sleeved top. 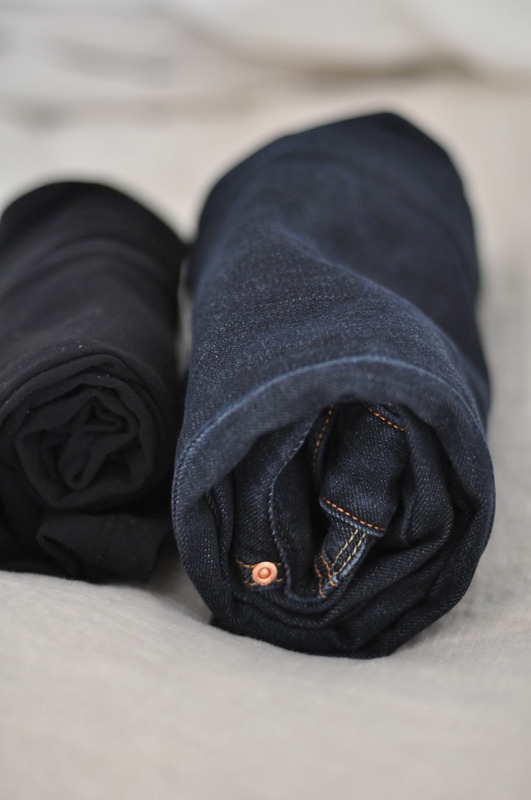 James Perse leggings and Gap jeans alternated over six days. And in case it gets chilly at night, a cotton sweater from Anthropologie. Did I have any accessories? I DID bring some jewellry - a few necklaces and such. But I didn't wear much of it. And it all can squeeze into a carryon to save MORE time at the airport. That's it for six days away.